Our fully cloud-based service allows you to seamlessly integrate your legacy PBX or PSTN voice service with Cloud PBX for Skype for Business™ without compromising your dial plan or PBX capabilities. 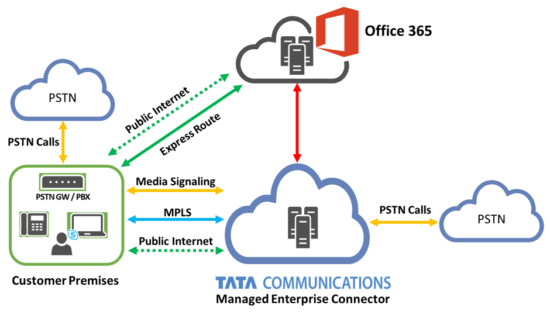 Powered by our global reach and Global SIP Connect™, Managed Enterprise Connector enables Enterprise Voice for your existing Cloud PBX, and also integrates with your legacy Lync or Skype for Business™ deployments. Our solution is future ready for integration with Microsoft Teams once Enterprise Voice integration capabilities are available for Microsoft Teams, hence improving the productivity of your teams. Our service is compliant with the telecom regulatory requirements of most countries, including India. Feel confident to partner us for your global communications needs and realise your organisation’s digital transformation plans today. Our world-class Unified Communications as a Service (UCaaS) brings you the full power of Skype for Business™ across your enterprise, and so much more. As the largest international voice provider with 52 billion voice minutes each year, we are your optimum choice for UCaaS voice services. Choose from a wide range of services including international toll free (ITFS), Universal Freephone (UIFN), Local Number and Domestic Service. In addition, our global relationships with more than 1600 carriers ensure state-of-the-art communication and collaboration wherever in the world you conduct business. With our single pane of glass solution for management and monitoring, the UCaaS solution gives your teams access to intelligent software and monitoring, dashboards and reporting.